Unnatural Selection is a beautiful book. Oversized, coffee-table style, Unnatural Selection’s first impression grabs you. Katrina van Grouw has illustrated the text with her own line drawings, and she is an impressive artist. Her degree is in art, she has experience as a curator in the ornithology department of the Royal Museum in London, and she is married to an expert in (among other things) breeding pigeons. (She jokes that sharing information like that on a first date may not be the most romantic gesture a man might use…but since it worked, perhaps breeding fancy pigeons is an underappreciated way to a person’s heart.) Therefore her text is sound and scientific, and her art is informed by both passion and expertise. 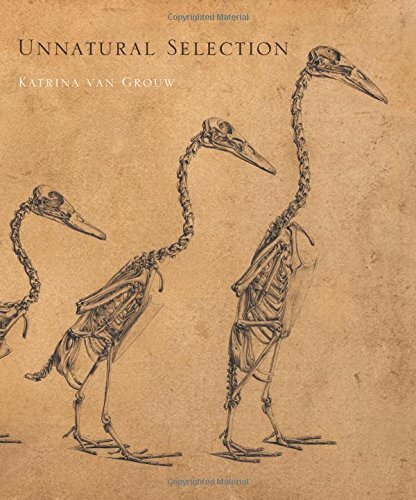 Unnatural Selection is almost a book about evolution. Almost. It is a book about selective breeding, human guided breeding of animals to obtain desired characteristics and to minimize unwanted traits. Natural selection, part of the process that shapes evolution, does not “care” whether an animal is pretty or friendly or any one of a number of other traits that human breeders might look for. Therefore, although the results are the same in terms of animals being changed over generations, the changes among domesticated animals tend to happen more quickly and do not necessarily carry any survival advantage to the animal, at least not one outside of captivity. Selective breeding, though, relies on the same genetic basis that governs evolution in the wild. Dominant and recessive genes show themselves according to the same laws whether an animal is born in the jungle or in the barn. The difference is instead of a predator looking for a weak animal to eat, a breeder or farmer is looking for specific traits to perpetuate. Although we may not like to think about this aspect of animal husbandry in our era where meat comes from supermarkets, the culling of animals that do not show those desired traits is just as efficient as predation in guiding the direction of a species. Van Grouw is a terrific writer with great passion and insight into her subject. Her drawings add beauty to the text and show the reader actual examples of the structures she is writing about. Whether the drawing is of a rare pigeon, a series of dog skulls, a detailed comparison of feathers, or a transitional drawing of a single animal showing hindquarters covered with skin, midsection with musculature, and the skeletal shoulders and skull, van Grouw’s drawings are exquisite and tell the story as eloquently as do her words. Her text is factual and informative, but also delightful and affectionate. I love how she simply refers to her spouse as “Husband.” She does not shy away from the realities of animal breeding: successful breeders cull. But she also fairly points out that the results are not inherently cruel or unfair, any more than disease or predation are cruel or unfair. The “goal” of life is to continue, and domestication is a form of symbiosis that has allowed dogs and chickens and cows and many other species to thrive around the world as they accompany humans. Unnatural Selection is a book that delights on multiple levels. It is well written, expertly researched, and beautifully illustrated. Any student of science, including younger readers, will appreciate it.